The fourth and final stop on our tour of Portugal was the tony seaside village of Cascais, on the Atlantic coast about 25 miles west of Lisbon. 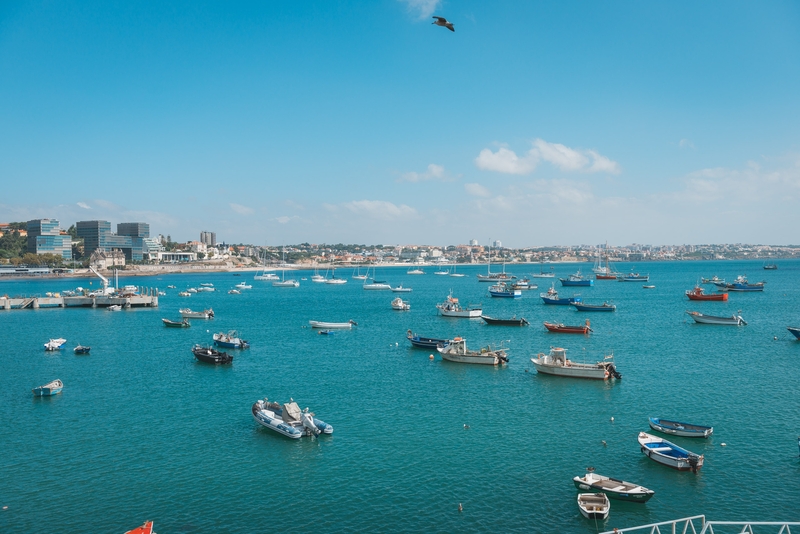 Cascais is where the locals go to get away from the city and enjoy the beach, and is also a wealthy community of coastal homes, second houses and seaside escapes. It's the Hamptons of Lisbon. Cascais is an easy 45 minute train ride from the City, or about 30 minutes by car. Leaving Porto Friday morning, we were up late, had breakfast, checked out from our hotel and were at the Vila Nova de Gaia train station for our 11:45 train back to Lisbon. We arrived at the Santa Apolonia station around 2:30PM, and were met by a taxi arranged by our hotel. The ride to Cascais was about 35 minutes and cost 25 Euro, but was much easier than juggling transfers among trains and taxis to take the local line. 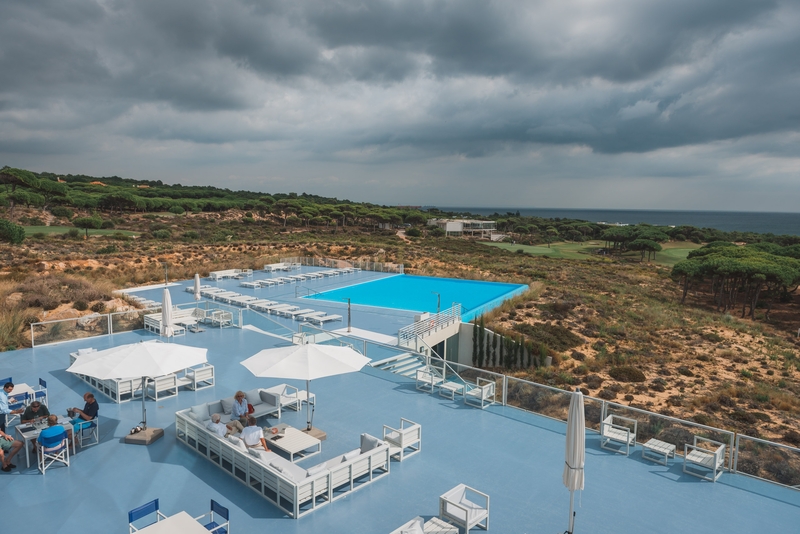 Our hotel was new and part of a golf course resort called Oitavos, situated directly on the Atlantic coast. Although part of a national park, the hotel and golf course was surrounded by a handful of really, really expensive homes. Given it was the low season, we nearly had the place to ourselves save for a few out-of-town golf groups attending a corporate retreat. The hotel's design was very modern, but tastefully done and a nice change after the more traditionally-styled places we had stayed prior. We designed our itinerary such that this final stop would be the slowest, most-restful and beachiest/poolest part of the trip. Those objectives were coming together nicely, though it was a bit cooler and windier than we would have liked. 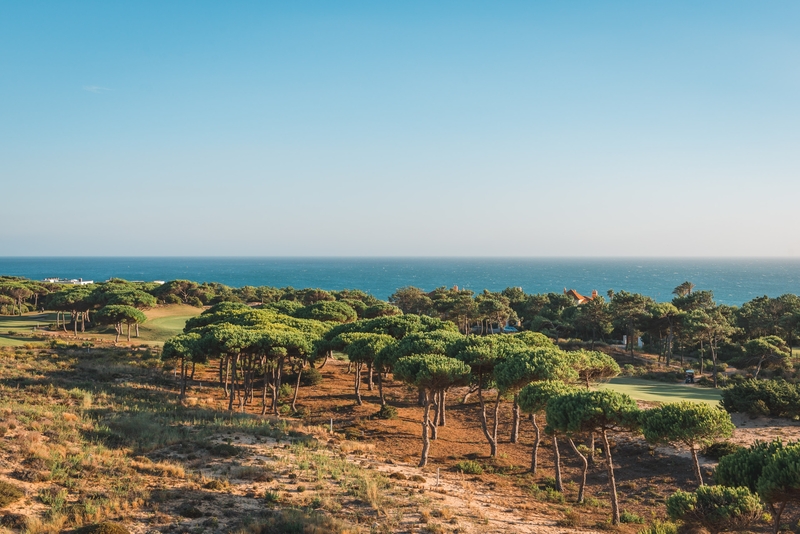 As I mentioned in an earlier post, we missed the ideal beach weather by a few weeks, so we were relieved we didn't make the effort to travel to Portugal's southern coast as it likely would have been just as cool and windy there. We had a light lunch by the pool, followed by a nap and a late dinner in the hotel. As empty as the hotel was, the hotel's restaurant is a local attraction and was quite busy when we dined. The rowdy British and German golfers were making short work of the hotel's stock of liquor, and were settling in for a weekend of playing golf, drinking and watching the Ryder cup; a good weekend for European golf fans. The next morning we were up by 9AM and were met in the lobby by a representative from TouristCar, a local car rental agency. We determined it would be easier to see the things we wanted to see on Saturday by car, and then on Sunday we could simply drop the car at the airport and save the expensive cab fare. Having the car brought to the hotel was incredibly convenient. Once again, renting a car in Portugal was surprisingly cheap and easy. 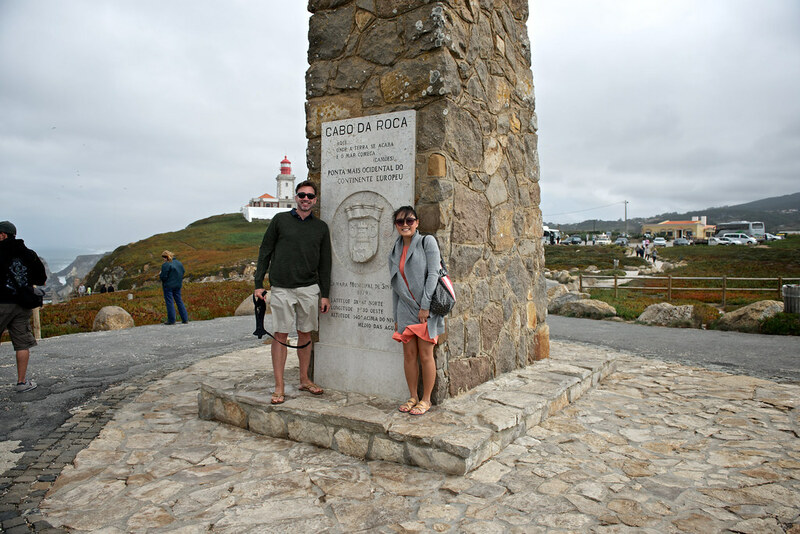 Our first stop was 20 minutes away, Cabo da Roca. 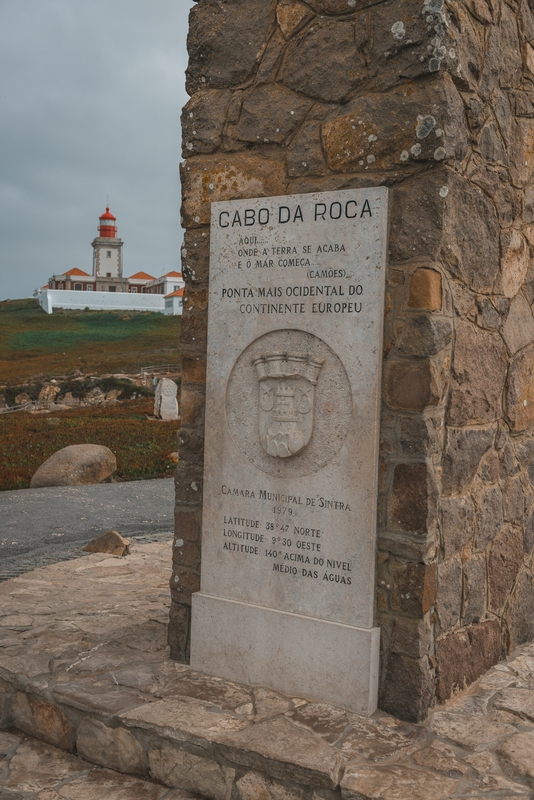 Cabo da Roca is the western-most point of Continental Europe, not including the various coastal islands that aren't directly attached to the mainland. The point sits on a cliff several hundred feet above the Atlantic and includes a lighthouse and an historic marker. The coastline reminded me of Northern California, with its cliffs, wind and fog making for beautiful but not always enjoyable coastal going. Cabo da Roca is a popular stop for tourists in Cascais and visitors to Lisbon. We arrived early enough to beat the crowds, but the buses were showing up in droves as we were leaving. This visit reminded me of my other geographic achievements, having also visited both the northern-most and southern-most Denny's restaurants in world (Fairbanks, Alaska and San Jose, Costa Rica, respectively). Editor's note: I believe the Denny's in Honolulu, Hawaii (at which I've also dined) is the western-most Denny's, but I'm not entirely certain. Note: click the photo below to see an animated sequence of us fleeing an approaching hoard of German tourists. 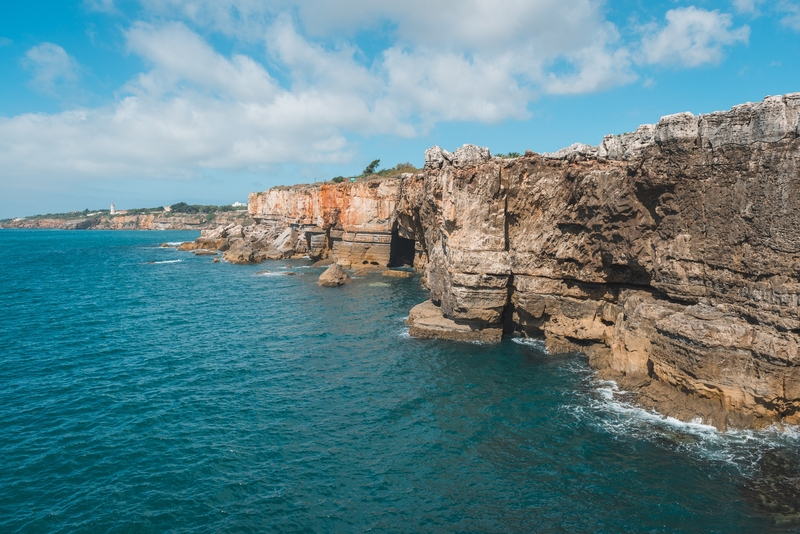 Our next stop was about 25 minutes to the south, where we visited a popular rock formation called Boca de Inferno, or "Mouth of Hell". 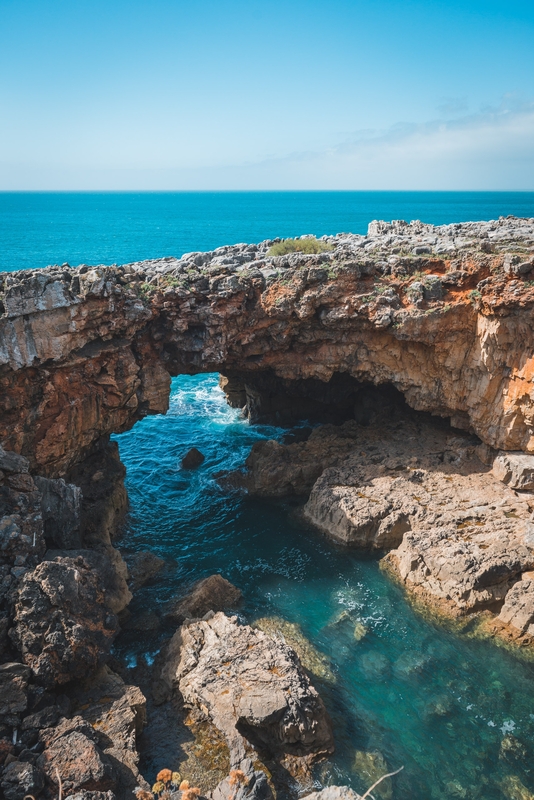 Boca de Inferno is a network of coastal caves that open unto a large, craggy lagoon just outside Cascais. During windy and wavy conditions, waves collide inside the caves and explode into a spectacular geyser of water that soaks the surrounding road and astonished onlookers. During our visit the sea was dead-calm without a wave in sight. The caves were interesting to look at, but we missed the main attraction. From Boca de Inferno we drove another few minutes into town. We parked the car and walked into downtown Cascais to look around and have lunch. 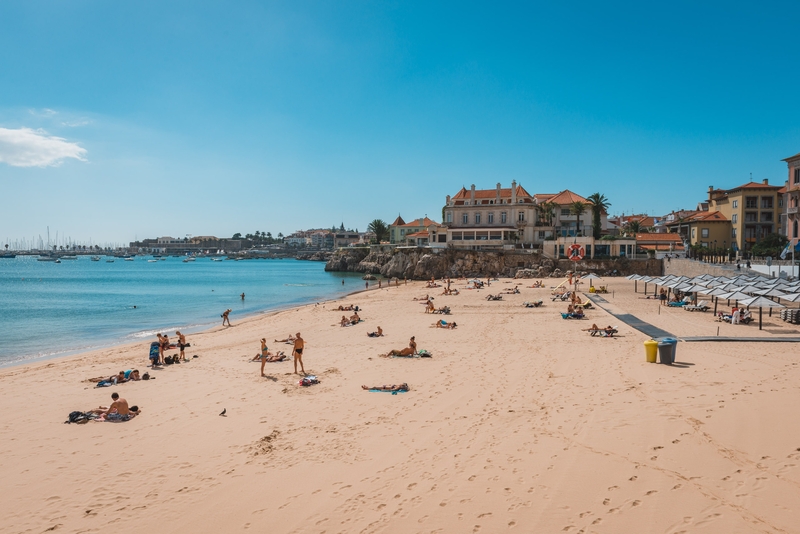 The Cascais waterfront sits in a protected bay far from the winds and waves of the open sea, and even on an otherwise cool and breezy day is still quite pleasant for boating and sunbathing. 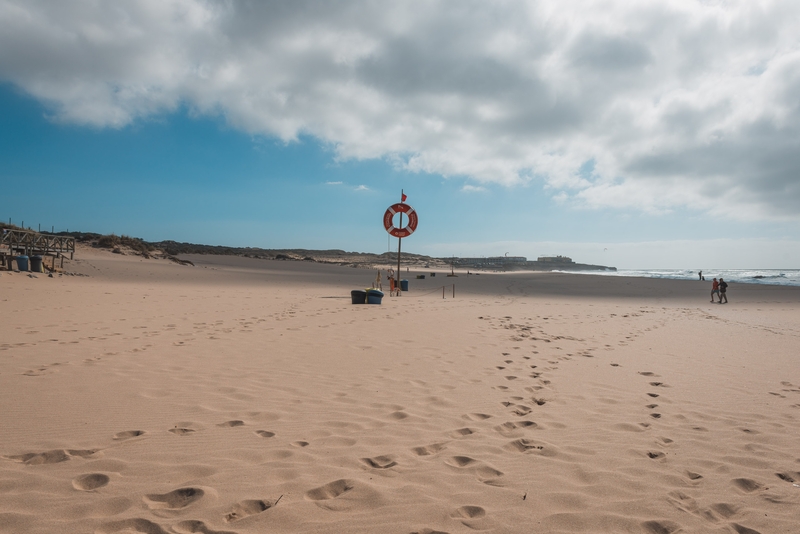 The beaches were pretty sparse during our visit, but during the high season are packed with beachgoers from nearby Lisbon. We decided to have lunch and explored many options before settling on one of the local favorites, Dom Manolo. 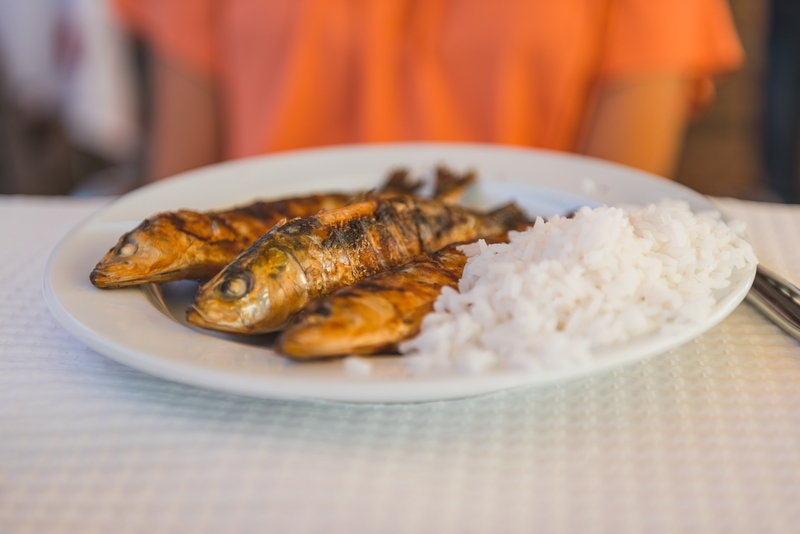 Specializing in Portuguese cuisine, Jessica had a plate of grilled sardines, a Portuguese speciality, while I had a "small" portion of roasted chicken piri-piri and a comically-oversized beer. After lunch we picked up our car and headed out to one of the large beaches just outside of town. The beaches were beautiful, but the water was cold and it was rather windy. 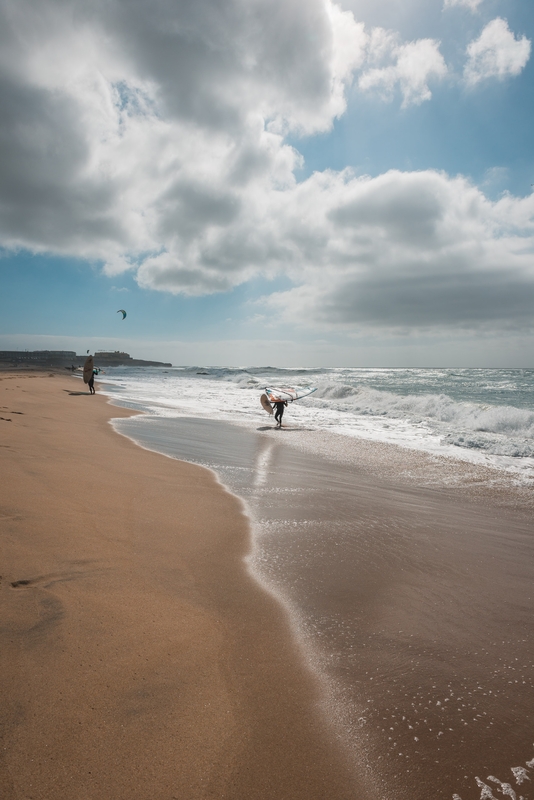 The wind is constant, we were told, making it a popular destination for wind surfers and kite surfers year round. 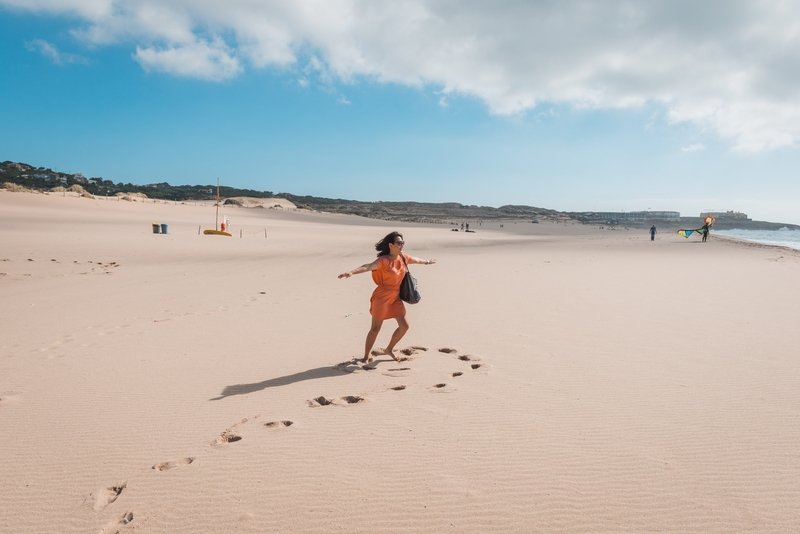 Like San Francisco, the coastal beaches are for admiring and beach-combing, while the interior beaches are better-suited for sunbathing and frolicking in the sand. 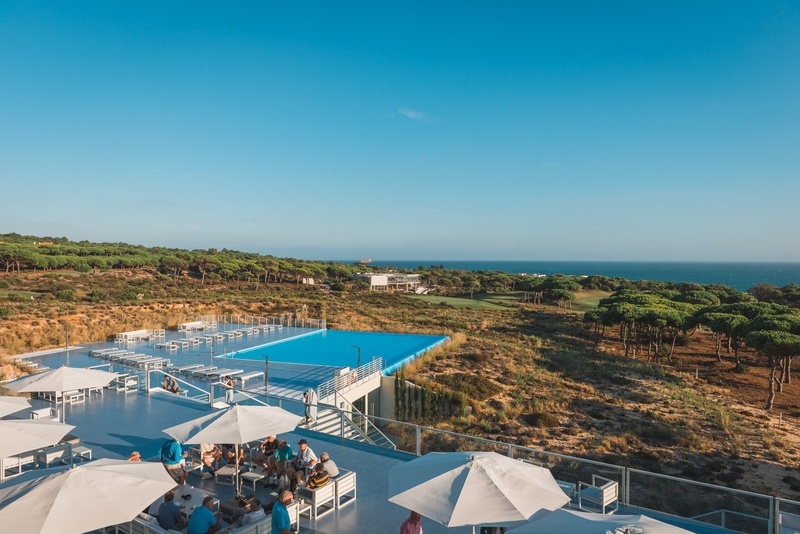 We didn't stay long at the beach, and made our way back to the hotel in time to enjoy the pool as the sun was shining brightly and the poolside bar was open for business. 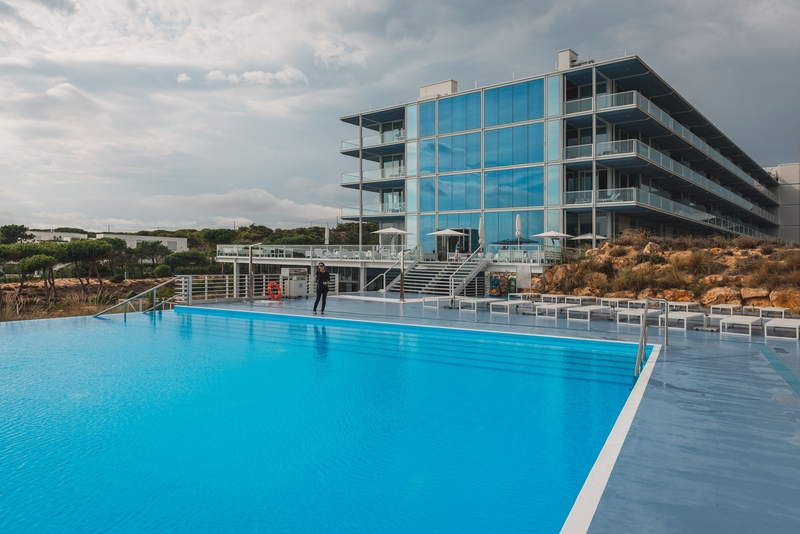 The outdoor pool was certainly picturesque, but unheated which I learned by jumping into it. Below this pool and near the spa was a large, super-heated indoor pool which we later enjoyed much more. That night we went to dinner at a popular local restaurant called Porto de Santa Maria. There's a waiting list for reservations during the summer, but we were easily seated without delay. The last dish on our must-eat list of Portuguese food was arroz con mariscos, a seafood-intensive version of paella. Most restaurants only serve this dish for two, but this one had it for one which freed me up to try the Portuguese steak with mushroom sauce. We both dined happily. That night we packed and went to bed late ahead of our flight back to New York. We had a 10:30AM flight, and with no Sunday morning traffic the drive to the airport took about 35 minutes. Returning the car was a bit unconventional. TouristCar doesn't have a garage at the airport, instead they send one of their guys in a TouristCar company vest to meet us at Departures. Of course, we couldn't find him but after a few tense minutes, he somehow found us. We returned the car, checked into our flight and bided our time in the over-crowded Business Class lounge before our 7-hour flight back to Newark. 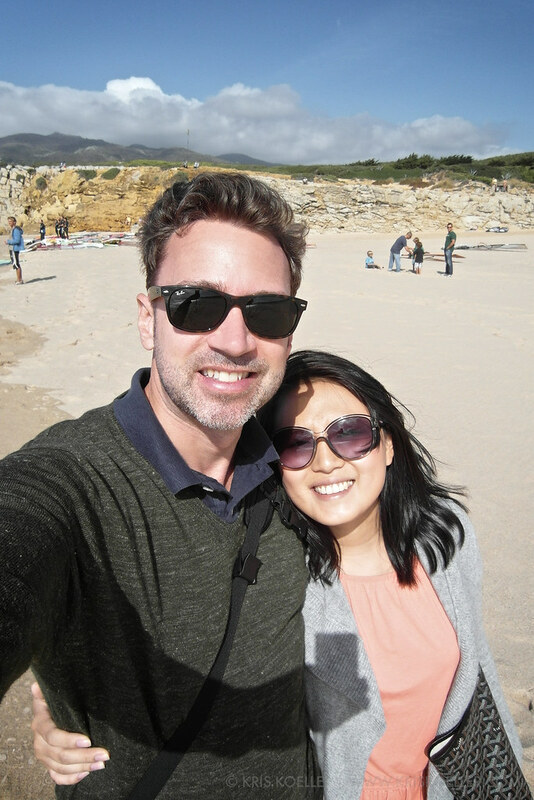 We decided to go to Portugal because we didn't know much about it and wanted go somewhere new. The more research we did the more excited we became to explore the country, and ended up having a difficult time narrowing down our itinerary into something that would be varied and interesting, while not harried and exhausting. On the whole we were pleasantly surprised, and had a wonderful time at every stop. We were impressed by the food and the wine, and found the Portuguese to be gracious and hospitable hosts. We would like to return to Porto and spend more time exploring that city and it's nearby wine regions of the Douro Valley, and we'd like to add a side trip to either Madeira or the Azores Islands, and lastly a journey to the southern coast, the Algarve. Luckily we left enough great things to do and had such a positive experience we're ready for a return trip. If you're thinking about a trip to Europe and not sure about Portugal, I highly recommend you give it strong consideration. Drop us a line and we'll gladly and enviously assist in your itinerary.